comes to buying fine wine online. What's more, we offer you convenient options for buying wine online. If you require personal assistance, simply give us a call and speak to one of our friendly and knowledgeable wine experts. We have a range of wine gift options and convenient gift certificates you can send to a friend, family member or loved one as well. AS WINE SPECIALISTS, we meticulously do all the necessary homework on the wines from the finest regions before we make our recommendations to customers. All wines are thoroughly investigated and fully researched. Wines are assessed with regard to quality, price value ratio and are carefully compared to others from the region. Once they meet our required standards, they must then be finally approved by our standing tasting panel. Any wines deemed unacceptable are discarded. You benefit in that every wine we offer has been "HAND PICKED" as the best in its category. You save time and money by immediately experiencing only the best wines available from the region. We've worked hard to become one of the best fine wine establishments in the country. When you're ready, we're ready to serve you. So, call, email or order online today. And remember that we offer FREE case delivery anywhere in Connecticut. "Personally dealing with my "wine advisor" at Grapes has been pleasant and very rewarding. 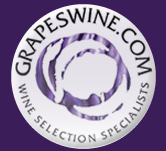 Their expert wine advice is absolutely superb!"